We have several great therapist, very skilled and licensed, book today! Used for centuries massage has proven to soothe your nerves and improve your mood. Get a bundle of THREE for less than the price of TWO! Our body scrubs involve all natural blends of organic anti-aging and ultra-moisturizing raw sugars to exfoliate dull, dry skin leaving you hydrated with a youthful radiance. 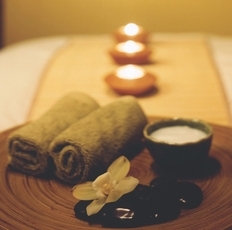 A deeply relaxing full body massage that can soothe tired muscles, improve circulation and vitality. ​This treatment is a more intensive form of Swedish massage that reaches the underlying layers of the connective tissue. The fantastic art of using heat & stones. Ask for our pain-relieving balm to relieve muscle soreness and stiffness. Used for centuries, essential oils have been proven to soothe your nerves and improve your mood. ​(3, 6 and 12 month commitments) For people who know they need it once a month!